Have you ever noticed that WordPress loading speed decreases dramatically when you add more content to your site? This is a well know issue as WordPress is badly optimized when it comes to loading speed and resource usage. Good news is that you can change this with the help of WP Super Cache plugin. 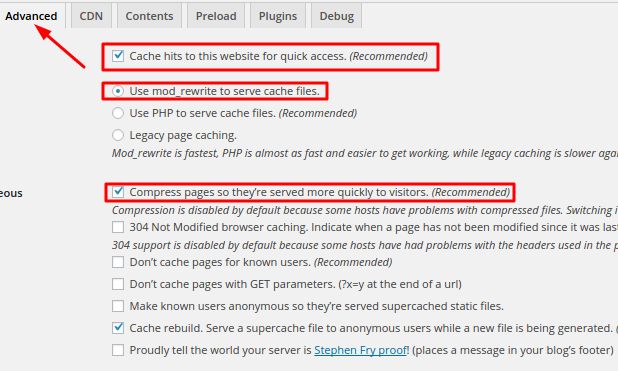 WP Super Cache is a static caching plugin for WordPress. It generates html files that are served directly by Apache webserver without the need to process resource-hungry PHP scripts. This helps to speed up WordPress and reduce resource usage. In this tutorial you will learn how to install and properly configure WP Super Cache plugin. Login to your WordPress admin area at yourdomain.com/wp-admin (change yourdomain.com to your actual domain name). One the left side of the screen you will see menu, press on Plugins tab and hit Add New button which is located at the top of the page. Enter WP Super Cache in the Search Plugins field and hit Enter button. First search result will be WP Super Cache plugin. Press Install button in order to proceed and install it. Once installation is complete, press Activate Plugin button. IMPORTANT! 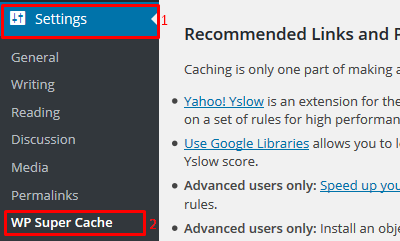 It is strongly recommended to disable all other caching plugins. You can easily deactivate installed plugins on Plugins section by pressing Deactivate button below the appropriate plugin. On the left menu press Settings and choose WP Super Cache tab. You are now on Easy settings tab. Turn on caching by selecting Caching On radio button and hit Update Status button. Cache hits to this website for quick access. This option turns on advanced caching. Use mod_rewrite to serve cache files. mod_rewrite is built directly into Apache. It means that when a visitor comes to your site, only Apache processes will be executed. This option is fastest as it does not start PHP processes. If you get any errors after enabling this feature, it is possible that mod_rewrite is disabled on your server. In this case select Use PHP to serve cache files. This option generates html pages, but uses PHP to serve them. Unfortunately, it is not as fast as mod_rewrite as it invokes PHP processes, but still better than nothing. Compress pages so they’re served more quickly to visitors. This feature will significantly reduce the size of your files. Press Update Status button to apply changes. Large yellow message box containing Mod Rewrite Rules should appear. Scroll down and press Update Mod_Rewrite Rules button. You should now see a green message labeled Mod rewrite rules updated. It means that you successfully updated your .htaccess file and advanced WordPress caching is now enabled. 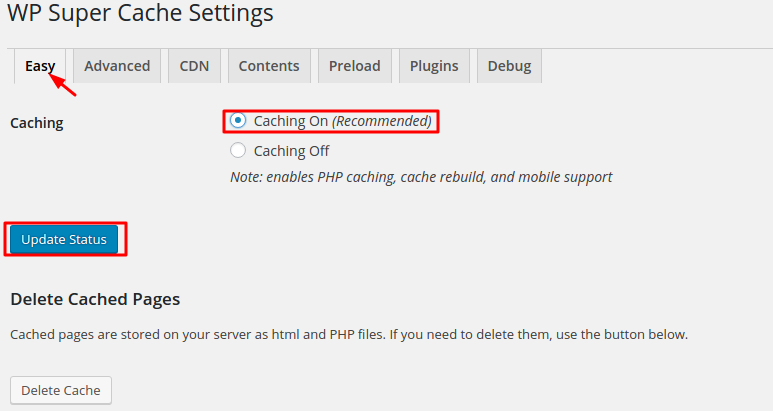 You finished this tutorial and learned how to install and configure WP Super Cache caching plugin on WordPress. Now you are ready to optimize and speed up your WordPress website. Visitors love fast websites! Thanks for sharing Complete setup of Wp super cache plugin.